Tissue factor, also called platelet tissue factor, factor III, or CD142, is a protein encoded by the F3 gene, present in subendothelial tissue and leukocytes. Its role in the clotting process is the initiation of thrombin formation from the zymogen prothrombin. Thromboplastin defines the cascade that leads to the activation of factor X—the tissue factor pathway. In doing so it has replaced the previously named extrinsic pathway in order to eliminate ambiguity. The F3 gene encodes coagulation factor III which is a cell surface glycoprotein. This factor enables cells to initiate the blood coagulation cascades, and it functions as the high-affinity receptor for the coagulation factor VII. The resulting complex provides a catalytic event that is responsible for initiation of the coagulation protease cascades by specific limited proteolysis. Unlike the other cofactors of these protease cascades, which circulate as nonfunctional precursors, this factor is a potent initiator that is fully functional when expressed on cell surfaces. There are three distinct domains of this factor: extracellular, transmembrane, and cytoplasmic. This protein is the only one in the coagulation pathway for which a congenital deficiency has not been described. In addition to the membrane-bound tissue factor, soluble form of tissue factor was also found which results from alternatively spliced tissue factor mRNA transcripts, in which exon 5 is absent and exon 4 is spliced directly to exon 6. TF is the cell surface receptor for the serine protease factor VIIa. The best known function of tissue factor is its role in blood coagulation. The complex of TF with factor VIIa catalyzes the conversion of the inactive protease factor X into the active protease factor Xa. Together with factor VIIa, tissue factor forms the tissue factor or extrinsic pathway of coagulation. This is opposed to the intrinsic (amplification) pathway which involves both activated factor IX and factor VIII. Both pathways lead to the activation of factor X (the common pathway) which combines with activated factor V in the presence of calcium and phospholipid to produce thrombin (thromboplastin activity). 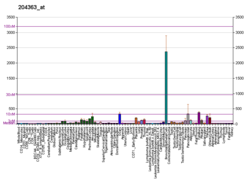 TF is related to a protein family known as the cytokine receptor class II family. The members of this receptor family are activated by cytokines. Cytokines are small proteins that can influence the behavior of white blood cells. Binding of VIIa to TF has also been found to start signaling processes inside the cell. The signaling function of TF/VIIa plays a role in angiogenesis and apoptosis. Pro-inflammatory and pro-angiogenic responses are activated by TF/VIIa mediated cleavage by the protease-activated receptor 2 (PAR2). EphB2 and EphA2 of the Eph tyrosine kinase receptor (RTK) family can also be cleaved by TF/VIIa. an extracellular domain, which consists of two fibronectin type III modules whose hydrophobic cores merge in the domain-domain interface. This serves as a (probably rigid) template for factor VIIa binding. a cytosolic domain of 21 amino acids length inside the cell which is involved in the signaling function of TF. Note that one of factor VIIa's domains, GLA domain, binds in the presence of calcium to negatively charged phospholipids, and this binding greatly enhances factor VIIa binding to tissue factor. Some cells release TF in response to blood vessel damage (see next paragraph) and some do only in response to inflammatory mediators (endothelial cells/macrophages). TF is expressed by cells which are normally not exposed to flowing blood such as sub-endothelial cells (e.g. smooth muscle cells) and cells surrounding blood vessels (e.g. fibroblasts). This can change when the blood vessel is damaged by for example physical injury or rupture of atherosclerotic plaques. Exposure of TF expressing cells during injury allows the complex formation of TF with factor VII. Factor VII and TF form an equal molar complex in the presence of calcium ions and this leads to the activation of factor VII on a membrane surface. The inner surface of the blood vessel consists of endothelial cells. Endothelial cells do not express TF except when they are exposed to inflammatory molecules such as tumor necrosis factor-alpha (TNF-alpha). Another cell type that expresses TF on the cell surface in inflammatory conditions is the monocyte (a white blood cell). Historically, thromboplastin was a lab reagent, usually derived from placental sources, used to assay prothrombin times (PT time). Thromboplastin, by itself, could activate the extrinsic coagulation pathway. When manipulated in the laboratory, a derivative could be created called partial thromboplastin, which was used to measure the intrinsic pathway. This test is called the aPTT, or activated partial thromboplastin time. It was not until much later that the subcomponents of thromboplastin and partial thromboplastin were identified. Thromboplastin contains phospholipids as well as tissue factor, both of which needed in the activation of the extrinsic pathway, whereas partial thromboplastin does not contain tissue factor. Tissue factor is not needed to activate the intrinsic pathway. Tissue factor has been shown to interact with Factor VII. ^ "Entrez Gene: F3 coagulation factor III (thromboplastin, tissue factor)". ^ Guo W, Wang H, Zhao W, Zhu J, Ju B, Wang X (January 2001). "Effect of all-trans retinoic acid and arsenic trioxide on tissue factor expression in acute promyelocytic leukemia cells". Chinese Medical Journal. 114 (1): 30–4. PMID 11779431. ^ Bogdanov VY, Balasubramanian V, Hathcock J, Vele O, Lieb M, Nemerson Y (April 2003). "Alternatively spliced human tissue factor: a circulating, soluble, thrombogenic protein". Nature Medicine. 9 (4): 458–62. doi:10.1038/nm841. PMID 12652293. ^ Ruf W, Disse J, Carneiro-Lobo TC, Yokota N, Schaffner F (July 2011). "Tissue factor and cell signalling in cancer progression and thrombosis". Journal of Thrombosis and Haemostasis. 9 Suppl 1 (Suppl 1): 306–15. doi:10.1111/j.1538-7836.2011.04318.x. PMC 3151023. PMID 21781267. ^ Eriksson O, Ramström M, Hörnaeus K, Bergquist J, Mokhtari D, Siegbahn A (November 2014). "The Eph tyrosine kinase receptors EphB2 and EphA2 are novel proteolytic substrates of tissue factor/coagulation factor VIIa". The Journal of Biological Chemistry. 289 (47): 32379–91. doi:10.1074/jbc.M114.599332. PMC 4239594. PMID 25281742. ^ Muller YA, Ultsch MH, de Vos AM (February 1996). "The crystal structure of the extracellular domain of human tissue factor refined to 1.7 A resolution". Journal of Molecular Biology. 256 (1): 144–59. doi:10.1006/jmbi.1996.0073. PMID 8609606. ^ Carlsson K, Freskgård PO, Persson E, Carlsson U, Svensson M (June 2003). "Probing the interface between factor Xa and tissue factor in the quaternary complex tissue factor-factor VIIa-factor Xa-tissue factor pathway inhibitor". European Journal of Biochemistry. 270 (12): 2576–82. doi:10.1046/j.1432-1033.2003.03625.x. PMID 12787023. ^ Zhang E, St Charles R, Tulinsky A (February 1999). "Structure of extracellular tissue factor complexed with factor VIIa inhibited with a BPTI mutant". Journal of Molecular Biology. 285 (5): 2089–104. doi:10.1006/jmbi.1998.2452. PMID 9925787. Gouault-Helimann M, Josso F (October 1979). "[Initiation in vivo of blood coagulation. The role of white blood cells and tissue factor (author's transl)]". La Nouvelle Presse Medicale. 8 (40): 3249–53. PMID 392457. Mackman N (July 1995). "Regulation of the tissue factor gene". FASEB Journal. 9 (10): 883–9. PMID 7615158. McVey JH (September 1999). "Tissue factor pathway". Baillière's Best Practice & Research. Clinical Haematology. 12 (3): 361–72. doi:10.1053/beha.1999.0030. PMID 10856975. Konigsberg W, Kirchhofer D, Riederer MA, Nemerson Y (September 2001). "The TF:VIIa complex: clinical significance, structure-function relationships and its role in signaling and metastasis". Thrombosis and Haemostasis. 86 (3): 757–71. PMID 11583305. Versteeg HH, Peppelenbosch MP, Spek CA (December 2001). "The pleiotropic effects of tissue factor: a possible role for factor VIIa-induced intracellular signalling?". Thrombosis and Haemostasis. 86 (6): 1353–9. PMID 11776298. Fernandez PM, Rickles FR (September 2002). "Tissue factor and angiogenesis in cancer". Current Opinion in Hematology. 9 (5): 401–6. doi:10.1097/00062752-200209000-00003. PMID 12172458. Golino P (May 2002). "The inhibitors of the tissue factor:factor VII pathway". Thrombosis Research. 106 (3): V257–65. doi:10.1016/S0049-3848(02)00079-8. PMID 12356487. Engelmann B, Luther T, Müller I (January 2003). "Intravascular tissue factor pathway--a model for rapid initiation of coagulation within the blood vessel". Thrombosis and Haemostasis. 89 (1): 3–8. doi:10.1267/THRO03010003 (inactive 2018-10-20). PMID 12540946. Morrissey JH (May 2003). "Tissue factor: in at the start...and the finish?". Journal of Thrombosis and Haemostasis. 1 (5): 878–80. doi:10.1046/j.1538-7836.2003.00219.x. PMID 12871349. Yu JL, May L, Klement P, Weitz JI, Rak J (February 2004). "Oncogenes as regulators of tissue factor expression in cancer: implications for tumor angiogenesis and anti-cancer therapy". Seminars in Thrombosis and Hemostasis. 30 (1): 21–30. doi:10.1055/s-2004-822968. PMID 15034795. Fernandez PM, Patierno SR, Rickles FR (February 2004). "Tissue factor and fibrin in tumor angiogenesis". Seminars in Thrombosis and Hemostasis. 30 (1): 31–44. doi:10.1055/s-2004-822969. PMID 15034796. Mackman N (June 2004). "Role of tissue factor in hemostasis, thrombosis, and vascular development". Arteriosclerosis, Thrombosis, and Vascular Biology. 24 (6): 1015–22. doi:10.1161/01.ATV.0000130465.23430.74. PMID 15117736. Belting M, Ahamed J, Ruf W (August 2005). "Signaling of the tissue factor coagulation pathway in angiogenesis and cancer". Arteriosclerosis, Thrombosis, and Vascular Biology. 25 (8): 1545–50. doi:10.1161/01.ATV.0000171155.05809.bf. PMID 15905465. Engelmann B (2007). "Initiation of coagulation by tissue factor carriers in blood". Blood Cells, Molecules & Diseases. 36 (2): 188–90. doi:10.1016/j.bcmd.2005.12.020. PMID 16473535. Furie B, Furie BC (2007). "Cancer-associated thrombosis". Blood Cells, Molecules & Diseases. 36 (2): 177–81. doi:10.1016/j.bcmd.2005.12.018. PMID 16490369. Mackman N (January 2007). "Alternatively spliced tissue factor - one cut too many?". Thrombosis and Haemostasis. 97 (1): 5–8. doi:10.1160/th06-11. PMID 17200762. Wiiger MT, Prydz H (July 2007). "The changing faces of tissue factor biology. A personal tribute to the understanding of the "extrinsic coagulation activation"". Thrombosis and Haemostasis. 98 (1): 38–42. doi:10.1160/th07-04-0289. PMID 17597988. 2aer: Crystal Structure of Benzamidine-Factor VIIa/Soluble Tissue Factor complex. This page was last edited on 9 March 2019, at 10:29 (UTC).